I didn’t use their recipe for frosting but I did use their cookies as an example. 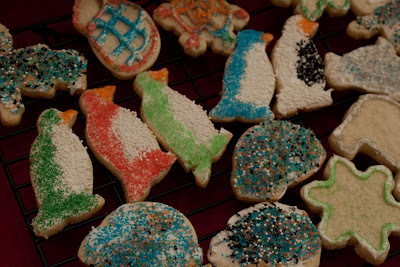 I used two different sugar cookie recipes for this. They look the same but they don’t taste the same. 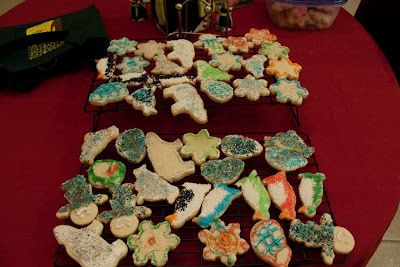 The first one I tried was called “The Best Rolled Sugar Cookie recipe” on allrecipes.com. I didn’t like the consistency of the dough when I tried to roll it out. Also, when I tried to roll it to 1/4″ like the recipe called for, it was entirely too thick. 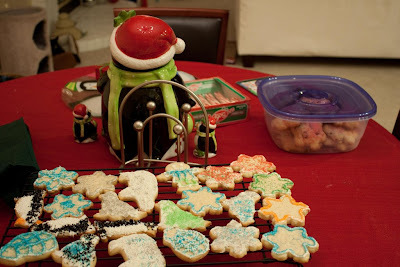 The cookies puffed and spread in the oven despite being cold. I rolled them to about 1/8″ and those worked much better. Unfortunately, I didn’t lower the oven temperature from 400F and some of them ended up burning because of their thinness. 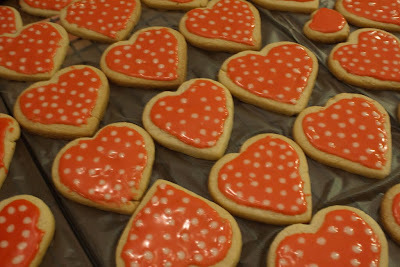 My experience with these was not so great but I know others that highly recommend them so I figured I would include them in this post in case anyone is looking for another sugar cookie recipe. 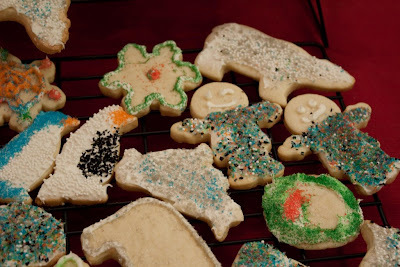 I changed the plan today to include making some of Alton Brown’s Sugar Cookies because it is a tried and true recipe for me and I wanted to see which were better. I am liking these better than the first ones but the real test will be when Carter gets home to taste them. 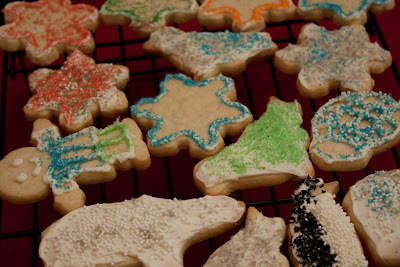 I used a really great recipe for Sugar Cookie Icing I found on allrecipes.com at Christmas. I changed it up a little because it was just not the consistency I needed. I started out with 3tsp of Corn Syrup and 3tsp of Milk. When I started out this way, I only had to add a small bit of corn syrup to it to make it perfect. I used gel food coloring to color the frosting. The tip the Disney article gives about putting the white dots on while the red/pink is still wet is a great idea. It allows the white dots to even out with the red ones so it looks really awesome. 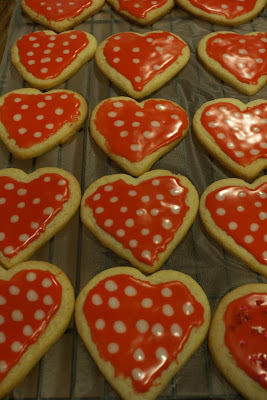 These were really simple cookies and so much fun to make! 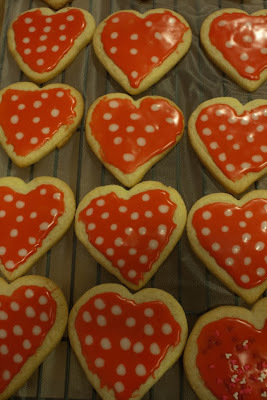 Posted by galadriel07 on February 13, 2011 in The Bakery! 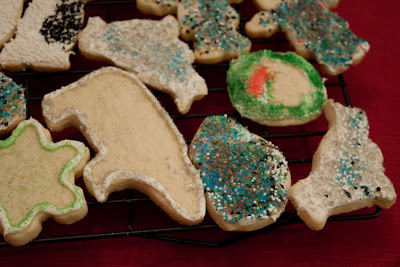 These are my first christmas cookies of the season! 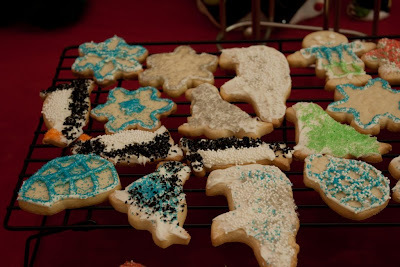 Alton Brown’s sugar cookies. They are actually very very delicious. 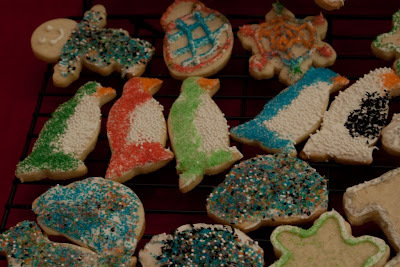 Probably the best sugar cookies I have ever made. 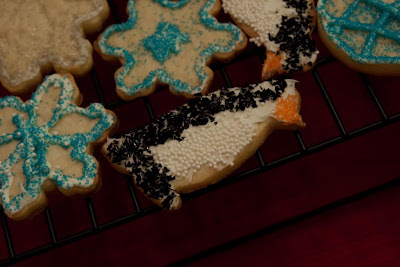 I didn’t make his royal icing but I had Pillsbury vanilla frosting in the spray can that I used for decorating plus a bunch of different colored sprinkles. Enjoy! 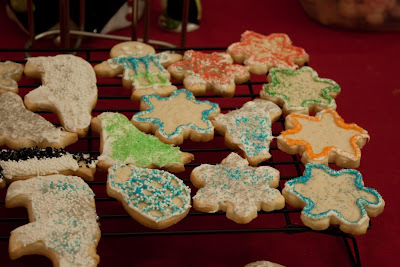 Posted by galadriel07 on December 3, 2009 in The Bakery!